New Haven Museum » Road Trip! Remember the excitement of piling into the car and heading out on the open road with family or friends? Explore the fun and adventure of the all-American auto expedition during Road Trip! Whether you got your kicks on Route 66 or at Connecticut clam shacks, you’ll marvel at vintage souvenirs and memorabilia from across the U.S., and from some of Connecticut’s cherished roadside landmarks. You’ll also enjoy photos by architectural historian Richard Longstreth, who captured the iconic and often amusing designs of the diners, gas stations, motels, and roadside attractions that flourished on America’s back roads before the advent of the interstate highway. Road Trip! also includes over 100 objects “crowdsourced” from New Haven residents, artifacts from the Connecticut Historical Society and Museum of Connecticut History, and a 1960s-inspired, turquoise-and-white diner booth specially built for the exhibit by the New England Seating Company. The exhibit spotlights vivid photographs of roadside architecture taken by nationally recognized architectural historian Richard Longstreth in the 1970’s including iconic diners, gas stations, motels, and roadside attractions that were constructed to serve the motoring public. With vintage photos of Connecticut’s roadside landmarks plus photos and souvenirs from residents of Greater New Haven, the visually-rich exhibit will explore the American sense of place, travel and adventure. 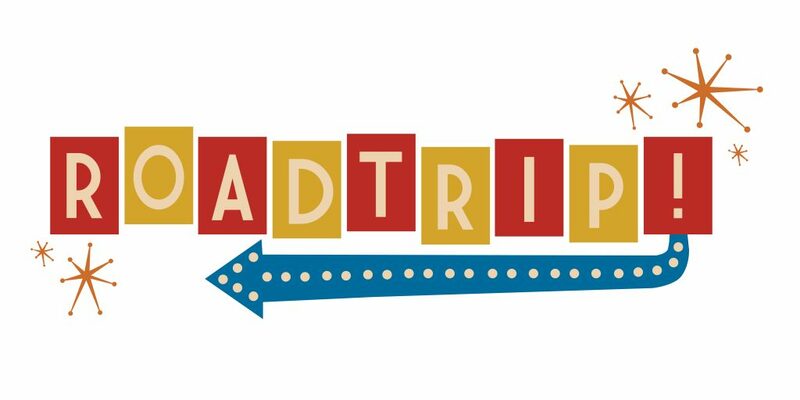 Curated by award-wining historic preservationist, architectural historian and author Mary Donohue, “Road Trip!” includes memorabilia from a treasure trove of resources such as the Museum of Connecticut History, historical societies, private collectors and more. Among Donohue’s chosen topics are food shacks/road food, the Berlin Turnpike, Historic two-lane highways, amusement parks, family resorts (a number of which were in Connecticut), gas stations, and the 1964 World’s Fair. Family road trips created vivid childhood memories for many of us. Whether it was a day trip to Savin Rock Amusement Park, a trip up to the mountains or down by the seashore, a trip to a family reunion or a grand adventure to Yosemite, we all remember what it was like to pack up the car and go. Our new exhibit will not only help to celebrate the 50th anniversary of the National Historic Preservation Act but let us connect to residents across Greater New Haven as they share their memories and mementos in the exhibition. Beginning in the 1920s, as more families were able to purchase automobiles, Americans of almost all classes took to the road for pleasure, taking a “drive in the country” a family outing to the beach, or piling into the station wagon and heading across the country to a national park. In Connecticut, a road trip could be a Sunday drive to the shoreline for seafood, a cruise down the Merritt Parkway for summer theatre, or a two-week trip to Yellowstone. Road Trip! also commemorates two monumental milestones: the 50th anniversary of the National Historic Preservation Act, which was created to protect places that embody the United States’ cultural heritage, and the 100th anniversary of the National Park Service, making America’s natural treasures the center of countless road trips for generations. For fans of streamlined diners and drive-in theaters and serious historians alike, roadside architecture has emerged as the study of the development of the roads, strips, and buildings designed specifically to accommodate the automobile traveler. Among the most studied roadways are the Lincoln Highway (1913), the first transcontinental road for autos from New York City to San Francisco, California, and Route 66 (1926), the “Mother Road” from Chicago to Los Angeles. Mary Donohue is the president of Grant House Heritage Services and serves as the assistant publisher of Connecticut Explored, the state’s history magazine. She was the deputy state historic preservation officer for the State Historic Preservation Office of the Connecticut Department of Economic and Community Development, and has co-authored three award-wining publications including, most recently, “A Life of the Land: Connecticut’s Jewish Farmers.” In 2012 she was awarded the Janet Jainschigg Award for Professionalism in Historic Preservation by the Connecticut Trust for Historic Preservation, and in 2011 the Frederick Law Olmsted Award by the Connecticut Association of Landscape Architects. A pop culture enthusiast, Donohue has written often on Connecticut’s road side architecture, food shacks, mid-century Modern motels, streamlined diners and roadside oddities.